Within these pages lies a comprehensive overview of both the traditional PQ indices in use today and new indices likely to be used in the future. a survey on PQ objectives around the world, with highlights on the economic aspects of PQ disturbances. Inside, you will find a thorough and well-balanced treatment on theoretical concepts and practical applications, enhanced by examples and exercises of PQ indices computation and use. This is an important resource for academics, students of power quality, reliability and electrical power systems courses, and also for practicing engineers involved in solving PQ problems in the new structures of liberalised energy markets. Pierluigi Caramia is associate professor of Electrical Power Systems at the University of Napoli ‘Parthenope’ (Italy). He received his MS degree in Electrical Engineering from the University of Cassino in 1991. His research interests concern power system analysis and power quality. In addition, he is a co-author of Chapter 8 and Chapter 11 of the book Time-Varying Waveform Distortions in Power Systems, published by John Wiley & Sons. He participates in the CIGRE and IEEE Working Group activities on power quality. Guido Carpinelli is a full professor of Electrical Power Systems at the University of Napoli ‘Federico II’ (Italy). He received his MS degree in Electrical Engineering from the University of Napoli in 1978. His research interests concern electrical power quality and power system analysis. He is the author of several papers in journals published by IEEE, IEE, IET and Elsevier. In addition, he is a co-author of Chapter 8 and Chapter 11 of the book Time-Varying Waveform Distortions in Power Systems, published by John Wiley & Sons. He participates in the CIGRE and IEEE Working Group activities on power quality. Paola Verde is a full professor of Electrical Power Systems at the University of Cassino (Italy). She received her MS degree in Electrical Engineering from the University of Napoli ‘Federico II’ in 1988. Her research interests concern power quality and power electronics in power systems. She is the author of several papers in journals published by IEEE, IEE, IET and Elsevier. In addition, she is a co-author of Chapter 8 and Chapter 11 of the book Time-Varying Waveform Distortions in Power Systems, published by John Wiley & Sons. She participates in the CIGRE and IEEE Working Group activities on power quality. 1 Traditional power quality indices. 1.2.2 Power quality disturbances and electromagnetic compatibility. 1.3 Power quality disturbances: indices and objectives. 2 Assessing responsibilities between customer and utility. 2.2 Waveform distortions and voltage unbalances: indices based on a single metering section. 2.2.1 Indices based on harmonic impedances. 2.2.2 Indices based on powers in non-ideal conditions. 2.2.3 Indices based on comparison with an ideal linear load. 2.3 Waveform distortions and voltage unbalances: indices based on distributed measurement systems. 2.3.2 The cost of deleterious effects index. 2.4.1 An approach based on the correlation between flicker level and load power. 2.4.2 An approach based on Gaussian probability functions. 2.4.5 Voltage and current-based approaches. 2.5.1 Disturbance power and energy approach. 2.5.2 Slope of the system trajectory approach. 2.5.4 Real current component approach. 3 Advanced methods and nonstationary waveforms. 3.2 Discrete time waveforms and windowing. 3.5.3 Some comparisons between DFT-based methods and parametric methods. 3.7 Transient waveform distortions (bursts). 4 Quantifying the quality of the overall supply voltage. 4.2 Global indices based on a comparison between ideal and actual voltages. 4.2.1 The normalized RMS error. 4.2.2 The normalized three-phase global index. 4.2.3 The voltage quality deviation factor. 4.3 Global indices based on the treatment of traditional indices. 4.3.2 The unified power quality index. 4.4 Global indices based on the economic impact on the customer. 4.5 Comparisons of global indices. 5 Distribution systems with dispersed generation. 5.2 Power quality variation indices. 6 Economic aspects of power quality disturbances. 6.2 Economic impact of power quality disturbances. 6.2.1 Cost of voltage dips in deterministic scenarios. 6.2.2 Cost of harmonics in deterministic scenarios. 6.2.3 Cost of voltage dips in probabilistic scenarios. 6.2.4 Cost of harmonics in probabilistic scenarios. 6.3 Some economic mechanisms for improving power quality levels. 6.3.1 USA: a mechanism based on the harmonic-adjusted power factor. 6.3.2 USA: a proposal based on the service quality index. 6.3.3 Argentina: a mechanism based on the equivalence between voltage quality and continuity. 6.3.4 Colombia: a mechanism based on the customer’s perception of the impact of each disturbance. 6.3.5 Iran: a proposal based on a penalty function depending on the type of customer. 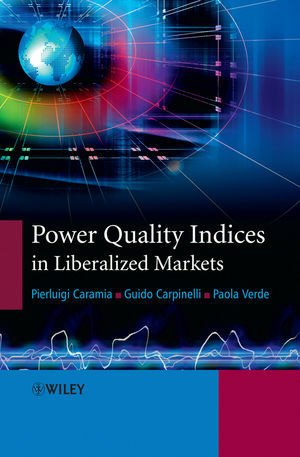 6.3.6 Italy: a mechanism based on the unified power quality index. 6.3.7 Various countries: power quality contracts.